Walden was the son of a Jersey dentist, Harold Walden. After studying dentistry in 1981, he began his career as an entertainer and keyboard player at the Sands nightclub in Jersey, performing under the name of Syndrone and Animal and his Crazy Organs. In 1988, Walden tried ecstasy for the first time at a London pub where he was playing a gig with his rock band Joshua Cries Wolf, subsequently switching from rock to house music. Soon after, he joined forces with the likes of Seal and Adamski. In 1989, Guru Josh released "Infinity," also known as "Infinity (1990's... Time for the Guru)," from his debut album Infinity. The song was originally produced for a friend of Guru Josh's who was organising a warehouse party of the same name, and gained attention when it started to be played by Haçienda DJ Mike Pickering. The song achieved success in Europe, especially in Germany, the UK, Portugal and Austria. The song was later re-mixed and re-released on multiple occasions (the most popular remix by Klaas), still receiving particular success in 2011. Guru Josh released several other singles in the 1990s including "Freaky Dreamer," "Holographic Dreams," and "Whose Law (Is It Anyway? )," which reached number 26 and number 12 in the UK and Germany, respectively. "Hallelujah" was released in 1991. Shortly after this, Guru Josh diversified into also doing multimedia production creating the Dance in Cyberspace series of music videos under the name of Dr. Devious and also VR, in collaboration with Darrel Jameson, Guy Labbé, Dave '10 inch Flipping Mental' Evans, Marcus Pennell and others. Following the success of "Infinity", Guru Josh moved to Ibiza, concentrating on art and running a promotions company. In 2007, he was part of Guru Josh Project, formed by Darren Bailie and signed by Big City Beats. The group consisted of Paul Walden, Anders Nyman, and Darren Bailie. In 2008, "Infinity" was re-released as "Infinity 2008", which was remixed by the German DJ Klaas. It experienced widespread success, peaking at number one on the Belgian, Dutch, French and Danish singles charts, the Czech airplay chart and the Eurochart Hot 100. In 2010, he released a new single entitled "Frozen Teardrops". In March 2011, he released "Love of Life", with a more modern and punchy house style, and it has been remixed by Sgt Slick, Digital Freq, and The Fusion & DJ Dima June. In 2012, saw the release of a remix of the 1989 original of "Infinity" called "Infinity 2012" by Guru Josh, with the main remix done by DJ Antoine. This single was then used by Langnese for a large marketing campaign promoting a new product launch during the summer of 2012 in Germany, Austria and Switzerland. Guru Josh created the 3D glass art under the name of "Louie Fabrix", sold in small exhibitions in New York, Madrid, Paris and Berlin. Walden died on 28 December 2015 at the age of 51, taking his own life. "Infinity (1990s...Time for the Guru)"
"Whose Law (Is It Anyway?)" ^ "Guru Josh Project – Infinity 2008". Discogs.com. Retrieved 29 December 2015. ^ a b c Richards, Sam (3 September 2015). "From Voodoo Ray to Infinity and beyond – the story of the UK's biggest rave anthems". theguardian.com. Retrieved 4 September 2015. ^ a b Steffen Hung. "Guru Josh Project – Infinity 2008". Australian-charts.com. Retrieved 29 December 2015. ^ "Guru Josh Discography". Discogs.com. Retrieved 29 December 2015. ^ Nils Binz, Rene Pfeiffer. "Infinity 2012 ist der neue Magnum-Song". Bigcitybeats.de. Archived from the original on 1 November 2013. Retrieved 26 December 2012. ^ "Magnum Infinity (offizieller Kinotrailer) mit dem Magnum-Song: Guru Josh – Infinity 2012". YouTube. 4 June 2012. Retrieved 26 December 2012. ^ Needham, Alex (29 December 2015). "Guru Josh, rave star, dies aged 51". The Guardian. Retrieved 29 December 2015. ^ Sweeting, Adam (5 January 2016). "Guru Josh obituary". The Guardian. Retrieved 23 February 2019. Guru Josh: "Official Charts > Guru Josh". The Official UK Charts Company. Retrieved 30 December 2015. Guru Josh Project: "Official Charts > Guru Josh Project". The Official UK Charts Company. Retrieved 30 December 2015. Top 50 peaks: "australian-charts.com > Discography Guru Josh". Hung Medien. Retrieved 30 December 2015. ^ a b Steffen Hung. "Discographie Guru Josh". Austriancharts.at. Retrieved 29 December 2015. ^ "Offizielle Deutsche Charts > Guru Josh – Infinity (album)" (in German). GfK Entertainment. Retrieved 30 December 2015. ^ "dutchcharts.nl > Guru Josh – Infinity (album)" (in Dutch). Hung Medien. Retrieved 30 December 2015. ^ a b Steffen Hung. "Discography Guru Josh". Swisscharts.com. Retrieved 29 December 2015. ^ Roberts, David (2006). British Hit Singles & Albums (19th ed.). London: Guinness World Records Limited. p. 238. ISBN 1-904994-10-5. ^ Steffen Hung. "Finnish charts portal". Finnishcharts.com. Retrieved 29 December 2015. ^ Steffen Hung. "Les charts français". Lescharts.com. Retrieved 29 December 2015. ^ "Offizielle Deutsche Charts > Guru Josh (singles)" (in German). GfK Entertainment. Retrieved 30 December 2015. ^ "Die ganze Musik im Internet: Charts, Neuerscheinungen, Tickets, Genres". Musicline.de. Retrieved 29 December 2015. 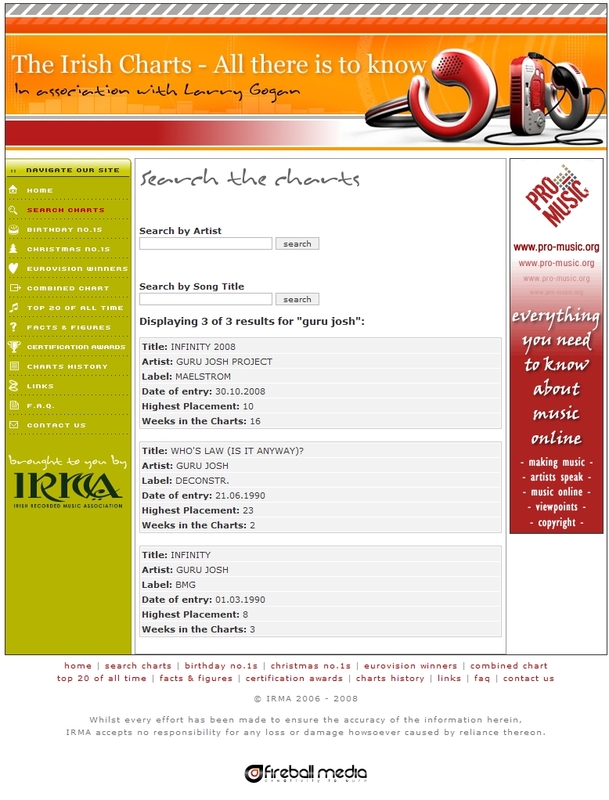 ^ "The Irish Charts – All there is to know (search results for Guru Josh)". Fireball Media. Retrieved 30 December 2015. ^ Steffen Hung. 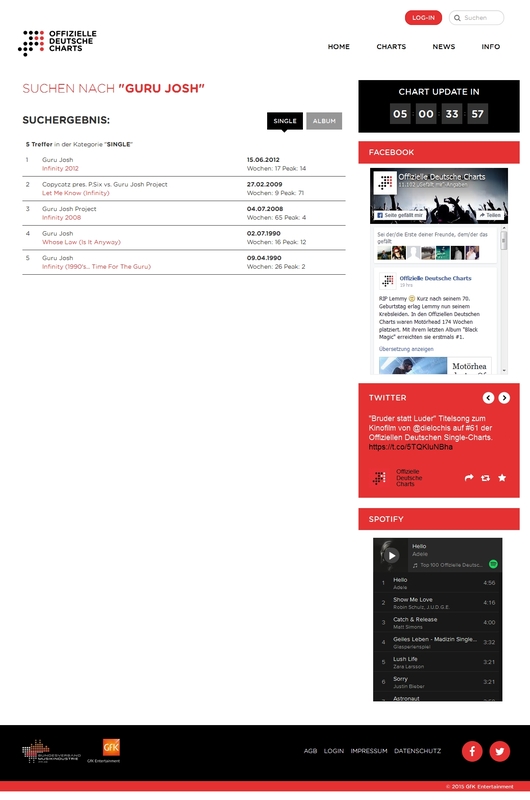 "Italian charts portal". Italiancharts.com. Retrieved 29 December 2015. ^ Steffen Hung. "Dutch Charts". Dutchcharts.nl. Retrieved 29 December 2015. ^ Steffen Hung. "Norwegian charts portal". Norwegiancharts.com. Retrieved 29 December 2015. ^ Steffen Hung (31 July 2008). "Swedish Charts Portal". Swedishcharts.com. Retrieved 29 December 2015. This page was last edited on 23 February 2019, at 09:22 (UTC).